Prices for the five-seater Datsun GO begin at Rs 3.29 lakh, whereas the seven-seater MPV Datsun GO+ will be available at Rs 3.83 lakh (all prices ex-showroom Delhi). The 2018 Datsun GO and the Datsun GO+ have been launched in India today with several cosmetic upgrades inside and out. This is the first time in four years that the Datsun Go line-up has been updated in India. Prices for the five-seater Datsun GO begin at Rs 3.29 lakh, whereas the seven-seater MPV Datsun GO+ will be available at Rs 3.83 lakh (all prices ex-showroom Delhi). These are introductory prices for the updated Datsun GO models. Pre-orders for the Datsun GO and Datsun GO+ have opened in India too. The units can be registered for a token amount of Rs 11,000. 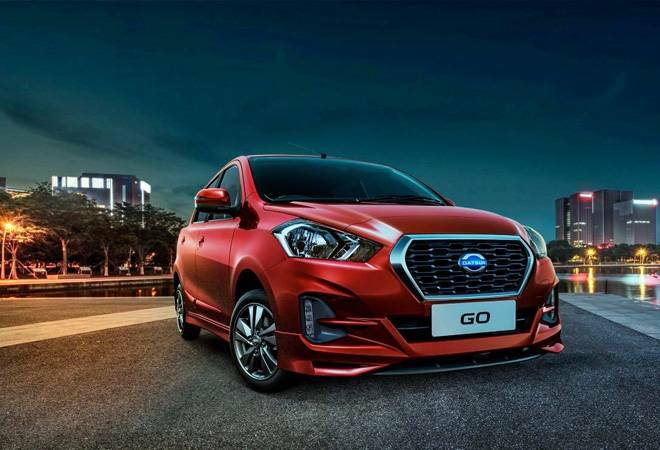 The Datsun GO and Datsun GO+ bear the same design language as the pre-facelifted models with different seating capacities. For starters, the cars now feature a redesigned bumper in their updated version. It comes with a revised airdam for a more imposing look and LED daytime running lights. The hexagonal grille has been tweaked a little too. The swept-back headlamps have been changed slightly too. Both the Datsun GO and the Datsun GO+ also get new colour options - Amber Orange and Sunstone Brown, respectively. Apart from adding some bold, sculpted line to the front, the Datsun GO and the Datsun GO+ come with bigger 14-inch diamond cut alloy wheels too. On the inside, the 2018 Datsun GO and Datsun GO+ feature similar looking dashboards with new features. While the Datsun GO will have an all-black layout, the Datsun GO+ is going with a dual-tone colour scheme in its interiors. Both the cars will have a analogue tachometer and a 7-inch touchscreen infotainment system with Apple CarPlay and Android Auto connectivity. The front row middle seat has been done away with in the new Datsun GO and Datsun GO+. The last two seats on the MPV Datsun GO+, on the other hand, are still a bit cramped. On the security front, both cars now come with dual airbags, ABS, reverse parking sensors and seatbelt reminder. Nothing has been changed under the hood, though. The Datsun GO and the Datsun GO+ will continue to sport the 1.2-litre three-cylinder petrol engine. The motor is capable of delivering 68ps of power and 104Nm of torque. Both cars will continue to be based on the same Datsun V platform as the earlier models.